For a generation, most Americans, whatever their politics, have largely admired Silicon Valley as an exemplar of enlightened free-market capitalism. Yet, increasingly, the one-time folk heroes are beginning to appear more like a digital version of President George W. Bush's “axis of evil.” In terms of threats to freedom and privacy, we now may have more to fear from techies in Palo Alto than the infinitely less-competent retro-Reds in North Korea. Once, we saw the potential unsurpassed human liberation available through information technology. However, Silicon Valley, as shown in the NSA scandal, increasingly has become intimately tied to the surveillance state. Technology has enabled powerful firms – including Verizon, Apple, Facebook, Microsoft and Google – to channel everyone's email and cellphone calls to the national security apparatus. Nor does the snooping relate only to national security. If my emails to friends and family arguably constitute a potential threat to national security, that's one thing. The massive monitoring and largely unapproved tapping into our data for profit is quite another. Google, which, in the first half of 2012, took in more advertising dollars than all U.S. magazines and newspapers combined, has amassed an impressive list of privacy violations, notes the Huffington Post. Even the innocent-seeming Gmail service is used to collect and sell information; Google's crew in Palo Alto may know more about the casual user than most of us suspect. Even Apple, arguably the most iconic Silicon Valley firm, has been hauled in front of courts for alleged privacy violations. For its part, Consumer Reports recently detailed Facebook's pervasive privacy breaches, including misuse of information as detailed as health conditions, details an insurer could use against you, when someone is going out of town (convenient for burglars), as well as information pertaining to everything from sexual orientation to religious and ethnic affiliation. The early Valley deserved our admiration for taking new technologies – semiconductors, in particular – and applying them to practical concerns ranging from machine tools to spacecraft and defense. The Internet itself was not invented by swashbuckling entrepreneurs but evolved from the Pentagon's Defense Advanced Research Projects Agency – DARPA. Eric Schmidt and Mark Zuckerberg did not pay to build the Internet; the taxpayers did. The new Valley elite are simply the latest to refine and exploit information technology for their own, often enormous, personal benefit. Nothing wrong with making money, to be sure, but this ambition is no different than those of Cornelius Vanderbilt, E.H. Harriman, J.P. Morgan, Andrew Carnegie, John D. Rockefeller, Henry Ford and Thomas Watson. Each innovated in a key industry, established oligarchic control and became fantastically rich. But even by the standards of bygone moguls, the new oligarchs' wealth has not been widely shared. Big Oil and the Big Three automakers created hundreds of thousands of jobs for a wide range of workers. In contrast, the tech oligarchs' contributions to American employment are relatively negligible. The geographical area enriched by the oligarchs has also narrowed. In previous Silicon Valley booms, outlying areas such as Sacramento and Oakland also benefited; not so much this time. Nor is the population expanding much, as one would expect from an economic boom. Although the massive outflow of domestic migrants over past decade – more than 20,000 annually – has slowed, still, more domestic migrants are leaving than coming. Part of this has to do with having the nation's highest housing prices relative to income, more than twice that of competitor regions like Austin, Texas, Raleigh, N.C., or Salt Lake City. Americans need to wake up to the reality of this new, and increasingly ambitious, ruling class. “The sovereigns of cyberspace,” like the all-powerful Skynet computer system in the “Terminator” series, are only recently focused on politics, and have concentrated largely in the Democratic Party (where the price of admission tends to be cheaper than in the old-money-dominated GOP). And it's not just money they are throwing at the game, but also the skillful political use of technology, as amply demonstrated in President Obama's re-election. Like the moguls of the early 20th century, who bought and sold senators like so many cabbages, the new elite constitute a basic threat to democracy. They dominate their industries with market shares that would make the old moguls blush. Google, for example, controls some 80 percent of search, while Google and Apple provide the operating system software for almost 90 percent of smartphones. Similarly, more than half of Americans, and 60 percent of Europeans, use Facebook, making it easily the world's dominant social media site. In contrast, the world's top 10 oil companies account for barely 40 percent of the world's oil production. Like the Gilded Age moguls, the tech oligarchs also personally dominate their companies. Sergey Brin, Larry Page and Eric Schmidt, for example, control roughly two-thirds of the voting stock in Google. Brin and Page each is worth more $20 billion. Larry Ellison, the founder of Oracle, owns just under 23 percent of his company; worth $41 billion, Forbes ranked him the country's third-richest person. Bill Gates, the richest, is worth a cool $66 billion and still controls 7 percent of his firm. 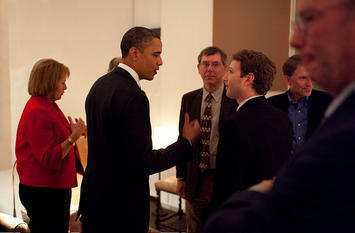 Newcomer Mark Zuckerberg's 29.3 percent stake in Facebook was worth $16 billion as of July 25, according to Bloomberg. These changes will require both Left and Right to change their attitudes. Progressives, for example, have tended to embrace the Valley's population for its generally “liberal” views on social issues and the environment. They have largely ignored the industry's poor record on hiring non-Asian minorities and the lavish, energy-consuming lifestyles of the oligarchs themselves. Some on the left are seeing the light. Britain's left-leaning Guardian newspaper has been in the forefront unveiling the NSA scandals and the complicity in them of the tech giants. Credit belongs to the EU, which, particularly in contrast with our government, has been asking the toughest questions about loss of privacy and the dangers of oligopolistic control. With Barack Obama secure in the White House, some American leftists have also begun to recognize the extreme inequality that has accompanied, and likely been worsened by, the ascendency of the digital aristocracy. Submitted by ymouel on Mon, 05/25/2015 - 08:25. Besides that, your blog is so popular among the searchers from search engines. Submitted by xijozx1122 on Mon, 05/11/2015 - 02:30. Submitted by xijozx1122 on Thu, 05/07/2015 - 05:05. Submitted by arceeboyDladiesman on Mon, 05/04/2015 - 20:42.
well what can we expect from this geeks and techies, forgive me for my choice of words but there was no harm intended, what I'm just trying to say is in today's world where almost all of us rely on technology, we cannot deny the fact that our lives are no more privacy we are now in constant fear that someone is hacking everything we do!!! Submitted by xijozx1122 on Sun, 05/03/2015 - 03:32. Submitted by xijozx1122 on Sat, 04/25/2015 - 03:23. Submitted by xijozx1122 on Wed, 04/22/2015 - 08:34. Submitted by xijozx1122 on Tue, 04/21/2015 - 07:13. Submitted by xijozx1122 on Sun, 04/19/2015 - 04:39. Submitted by xijozx1122 on Sat, 04/18/2015 - 08:44.